Keyboard types in use today. These are some of the commonly used computer keyboards. The most popular computer keyboard is the QWERTY format (the first image), chances are that it is staring at you right now (look down). 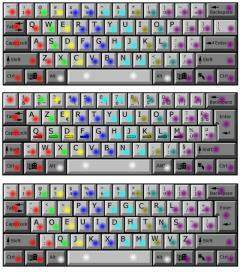 The second image shows an AZERTY keyboard which is used in some European countries. The third image is of a DVORAK type keyboard, while not overwhelmingly popular it does have its die-hard fans that breathlessly clamor that it provides for faster typing speeds. There may be some truth to the DVORAK myth. It is a well known fact that the original typewriters with their spring loaded keys were prone to jamming. Part of the problem was the mechanical arms of the keys that could hit each other when letters that were close to each other were pressed, and typing too fast would also jam the machines. The QWERTY format was designed to deliberately slow down typists! Thus preventing jams and avoiding expensive redesign of the typewriter. A hundred years later, electronic buttons are the new keys, and jamming due to speed are a thing of the past. Yet we continue to use the QWERTY format, so lets accept it, get on with it, and learn how to type on it!